Have you ever laid awake long after midnight knowing you’re exhausted but unable to settle or switch off your brain so you can actually sleep? Same. Luckily, a friend of mine was here to help. No doubt bored of my late-night WhatsApp messages and pointed tweets, she knew I needed some help to settle on days when stress, worries, and anxiety reared their ugly heads . 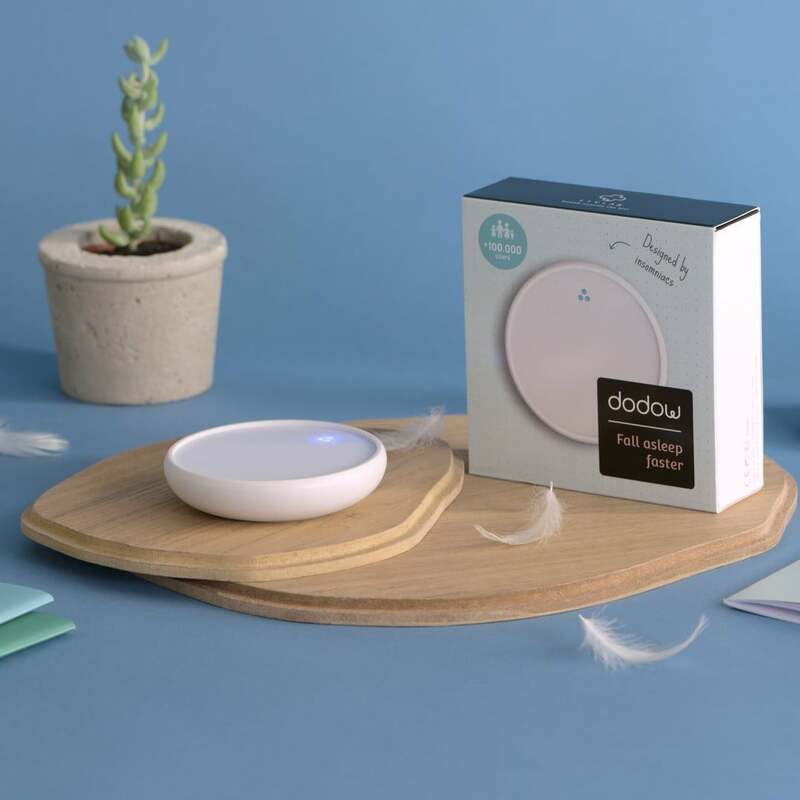 So she gifted me a Dodow Sleep Device ($59) for Christmas, and with it, the promise of a decent night’s sleep in 2019. The Dodow is not a particularly revolutionary or complicated gadget, but that’s part of its appeal. Rather than being a sleep machine with all kinds of settings, sounds, and applications, this coaster-sized, battery-operated device sticks to doing one thing well. It emits a gentle blue light onto the ceiling, which pulses up and down to help you master an essential breathing technique that will relax you into a deep sleep. Dodow has just two programs, an eight-minute cycle and a longer 20-minute one. Both have the aim of gently controlling your breathing so you’re eventually taking just six long breaths per minute. “By breathing long enough at the Dodow rhythm (six respirations per minute), you stimulate the baroreflex, a small physiological mechanism that restores the balance of the autonomic nervous system,” the site explains. The aim of this is to move you from an alert state to a more relaxed, drowsy one, hopefully resulting in sleep. As you’re concentrating on your breathing and following the light, you’ll find your focus shifts from thinking about other things, which is why so many people who find themselves wide awake at night due to worries or feelings of anxiety find this device helpful. I’ve been using my Dodow on and off for a couple of weeks now, and I can definitely vouch for how effective it’s been for me. At first it took a little getting used to: mine is on my nightstand, and for the first few uses, the light felt quite far back, as if by looking up I was straining my eyelids after the first couple of minutes. It took a couple of sessions to realize what was actually happening was that my eyes were just trying to close so I could sleep. I’ve only seen the end of the eight-minute cycle once, on my first use. Since then, I’ve drifted off before it’s even finished. The device turns itself off automatically after the cycle is over, or you can stop it (or restart it) at any time with a quick tap. So far, I’m really impressed with the Dodow and how easily it gets me out of my head and ready to sleep. But I think it’s important to note that I am not an insomniac and only have occasional issues sleeping. My sleep issues come mainly from the inability to switch off during busy or stressful times rather than a more serious ongoing sleep disorder. I don’t need to switch my Dodow on every night, and so far I’ve not had to even try the 20-minute program. But I do think that the device is worth trying if you do have more serious sleep problems. The longer program is there for a reason, and as the Dodow costs a lot less than most other sleep devices, it has to be worth a try. You have nothing to lose: the company offers a very generous 100-day return policy so you can really test it out to see if it’s right for you (just remember to keep all the packaging).